Cotswold wool was one of the most valuable fibers of the pre-industrial era. Due to it’s value, golden color from lanolin on shiny white fibers, and use, it was known as the Golden Fleece. 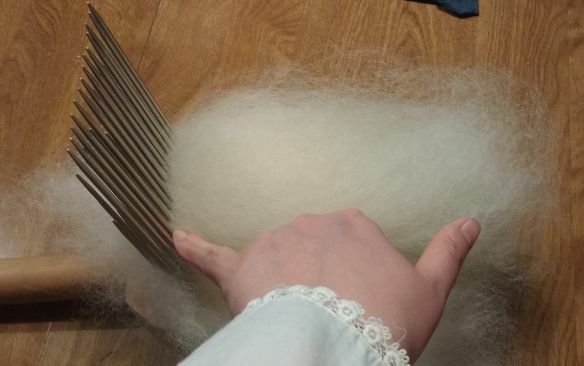 The fiber length makes the wool softer, stronger, and easier to comb and spin. This strong, and shiny fiber was ideal for the process of making “cloth of gold” for priests and rulers in northern climates, while linen was used for cloth of gold worn in warmer weather. Our fleeces are raw and full of veg matter, but they wash up and hand comb out to fluffy clouds of long staple fiber. Hand combing and worsted spinning brings out its lustrous, strong, and smooth character, ideal for weaving or lace yarn. I recommend a pair of combs with 3-4 rows of tines, although the long staple makes this pretty easy to flick if all you have is a dog brush. I like to spin from a distaff to keep long fiber managed. 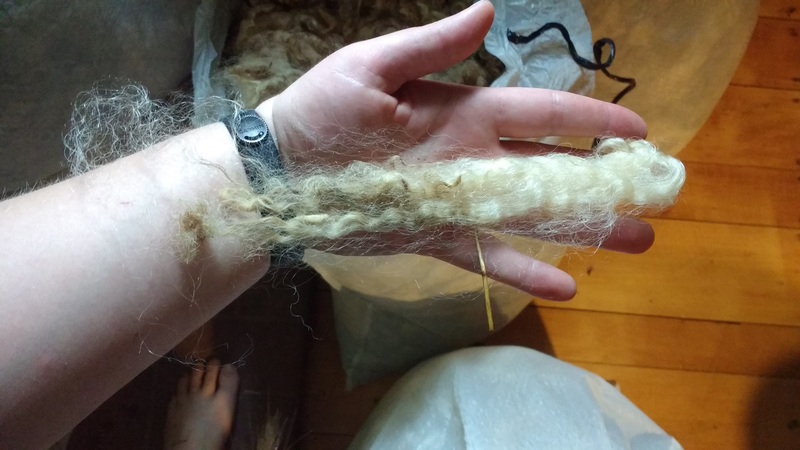 Most of my fleeces are around six pounds, I think the largest is 17 lbs. The smallest fleeces (may weigh less than six pounds) are higher quality lamb fleeces. My fleeces are NOT Santa beard quality fleeces. Those kinds of locks need to come from coated sheep. These need to be washed and combed, and will lose their curls in that process. E-mail us at farmer@eddyridgegrassland.com to inquire about current inventory and availability.